If you are looking for the best kilt accessories, then you’ve come to the right place. Kilts.com offers one of the internet’s largest collection of accessories for kilts to complete your outfit. All of our accessories are either made in the UK or the USA. We never sell any cheap imported goods. To complete your kilt outfit, you will need a jacket, shirt, bowtie (or necktie), sporran, kilt socks, kilt pin, sgian dubh and ghillie brogues (kilt shoes). If you need any advice as to what accessories to buy with your kilt, then please don’t hesitate to contact us, as we will only be too happy to help. Customer service is our top priority! 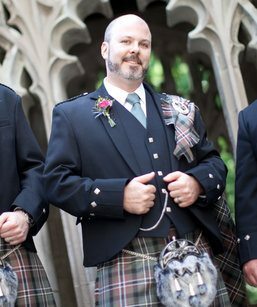 An example outfit for a formal occassion to go with your kilt would be a Prince Charlie Jacket, a Wing Collar Shirt with bow tie, a formal sporran, white kilt hose with a sgian dubh, and a kilt pin reflecting your clan. Make sure you grab a pair of ghillie brogues aswell.